It appears that your question might be answerable through commonly-available references. 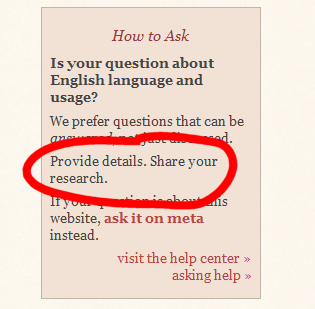 Please provide more detail about the research you've done, or consider if the question might be better suited to our English Language Learners sister site. Definitely could be answered using commonly-available references. Show no evidence of research, so it seems like they might be answered by common references. If the OP adds evidence of what research they did and why they're still confused, it might actually be a good question. Are too basic / obvious to native speakers, and don't fall within this site's charter. They might be good questions for ELL, but maybe not. There have been various discussions (like this one) that hint that an auto-migration path to ELL may never exist, even after it graduates. I would not oppose having three separate close reasons, but I think we're limited in how many we could have. I support Lynn's argument and suggestion. I believe it's up to the asker to demonstrate that a question is not answerable by General Reference, and research is the way to do that. A question is only put on hold not closed outright, in order that it can be reworked and re-opened [brought off-hold]. So saying that a question is answerable as General Reference is the same as asking for more research. I've already written an answer about research, which appears to have been well-received (apart from one member of the community, anyway). With regard to suggesting ELL, I'm not sure that this message is the place to do that, because it will result in cross-postings. It's better for members of the community to vote to close and flag for migration. Bear in mind that bad questions should not be migrated. Bad questions should be improved and then (if they are off-topic) be migrated to a site where they are on-topic. It appears that your question might be answerable through commonly-available references. Please provide more detail about the research you've done, in order to demonstrate that the answer is not easily available. There is scope for the target of the "research" link to be a different answer, or even a new custom-crafted question and answer: please use comments on this answer to suggest replacement links. They too could probably be improved; but we can leave that for a separate discussion (If you want to discuss them, please don't use comments here; write a fresh question). phenry's question about "too basic or uninteresting at +2, but countered by +6 argument for more research.